I love versatility. Especially in a kitchen appliance. And Cuisinart's new Convection Toaster Oven has versatility written all over it. 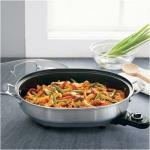 You can use it to bake, broil, toast, defrost, reheat; it does it all. And it looks good, too. Ah, the taste of Europe. Though panini is an Italian word, you'll find these hot, grilled sandwiches far beyond Italy's border. As a student in London, they were one of my favorite things for lunch on the run. Do you know someone moving out on their own for the first time? Or perhaps a budding chef that wants some kitchen tools to call her own? If you do, Cuisinart's 5-Speed Hand Mixer is a good place to start. This makes a great cup of coffee when the machine is clean. But it is never clean. Fondue parties are back in style. With what's-not-to-like ingredients like wine, melted cheese, bread--why did fondue ever go out of style, anyway? Probably because a lot of fondue makers are a pain to deal with. The idea of brewing coffee into a dispenser, then drawing it off into a cup is certainly not a new one. In fact the method is older than the coffeepot. 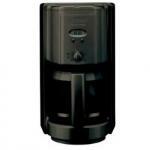 (See coffee urn.) Still, this style of coffeemaker is all the rage lately with java junkies. 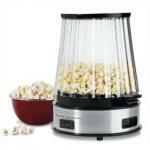 Never one to be left out of the game, Cuisinart has entered the popcorn market with their own version of an old fashioned popcorn popper. 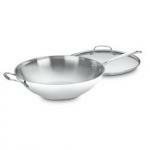 Anodized aluminum cookware has become very popular in the last few years. The technology of hard-anodizing aluminum produces a product that is very durable as well as being lighter and much less expensive than stainless steel. With the Cuisinart ICE-30BC, you can simply add your ingredients and turn the machine on. Twenty five minutes later you'll have two quarts of tasty frozen treat. The automatic mixing arm does the work so you don't have to. The CPT-120 comes with an astonishing nine browning levels in addition to the touchpad controls for reheat, defrost, bagel, and cancel settings. It works with both fresh and frozen toastable items. Inch and a half wide slots are roomy enough for larger items such as bagels and muffins. The Cuisinart CSB-78 Cordless runs for up to twenty minutes on a charge and recharges quickly. The set includes whisk, chopper, and sixteen ounce mixing and measuring beaker in addition to the blending shaft. The stylish matte finish to its brushed stainless steel shaft matches any decor. The Cuisinart SmartPower has six hundred watts of power ready to handle your blending needs. 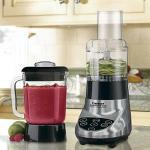 Its heavy die-cast metal base keeps the blender solidly in contact with the counter as you mix. The included fifty ounce glass jar has a strong plastic handle with a metal look. From a coffeemaker perspective, this setup gives you everything you could ask for to get the job done. That is of course as long as you don't mind being woken up every morning to the sound of cats with their tails caught in a garbage disposal. 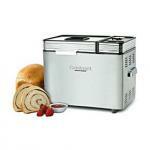 Make bread, doughs, jam, and even sweet cakes in this compact convection oven bread machine, the Cuisinart CBK-200. With separate cycles for Low-Carb, Gluten-Free and Artisan bread and thirteen more preset options, the programmable settings allow more than a hundred options.